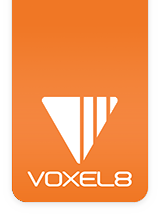 The Voxel8 Developer's Kit printer is shipped to you to optimally print PLA thermoplastic coupled with the conductive silver ink. However, because we offer a heated build plate, it is possible to print ABS. Printing single material ABS prints is supported as long as you follow the guidelines below. Printing of silver with ABS is not supported at this time. However, for smaller prints it is possible given the right conditions. We do not recommend printing silver with ABS at this time except for your own experimentation. 1. Load ABS filament into machine using the load/unload filament setting (see Picture 001a), or from Octoprint (see Picture 001b) by selecting the ABS selection for material type. Picture 001a: Loading ABS filament from the touch panel. Picture 001b: Loading ABS filament from Octoprint. 2. Apply glue stick (see Picture 002a) to build plate area where print will occur on the build plate (see Picture 002b) for best adhesion if possible. Picture 002a: Using a glue stick on the build plate for ABS adhesion. Picture 002b: Build Plate with either blue painter's tape or possibly Buildtak. 3. You will need to set a few selections inside of Dashboard (see Picture 003A-C). Picture 003: Dashboard settings for printing ABS. 4. Add a Config for "Mixin - ABS" which allows for printing silver and ABS together (see Picture 004). Picture 004: Dashboard config for ABS printing. 5. Set Build Plate to 105 F within Dashboard (or Octoprint) if it is not already set (see Picture 005a & b). Picture 005a: Setting the build plate temperature for printing ABS (Dashboard). Picture 005b: Setting the build plate temperature for printing ABS (Octoprint). 6. Set Dashboard to print Skirt (Brim is optional), but will possibly help with adhesion of ABS part to the build plate (see Picture 006). Picture 006: Selecting skirt (and optionally brim). 7. Close lid of the Developer's Kir Printer (see Picture 007) and wait for build chamber to achieve stable temperature for printing ABS. Typically this is approximately 1/2 hour. Picture 007: Closing the lid to keep the chamber at optimal temperature for ABS printing. 8. Keep the print chamber closed and start print job. Watch for silver to adhere to printed thermoplastic part. 9. After the print job is completed; remove part, but be careful that the build plate still might be warm/hot.